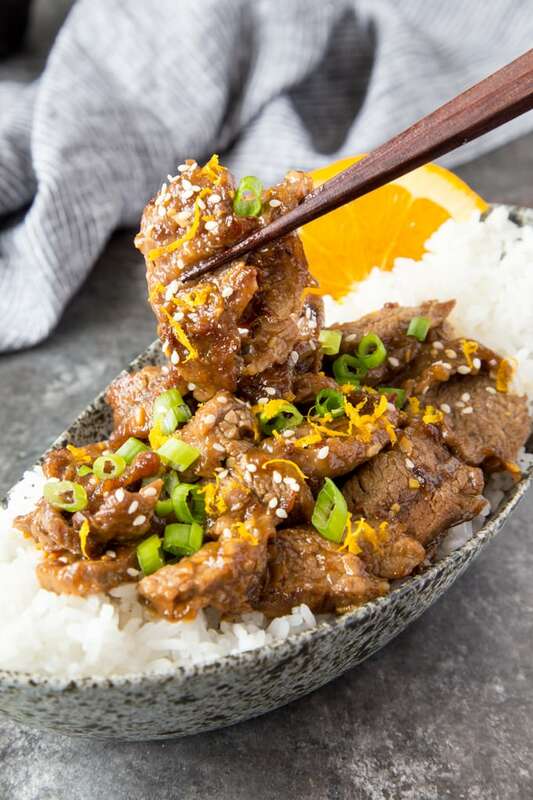 Skillet Sesame Orange Beef – Tender strips of beef are smothered in a flavorful sesame orange sauce with garlic, ginger and a touch of brown sugar. 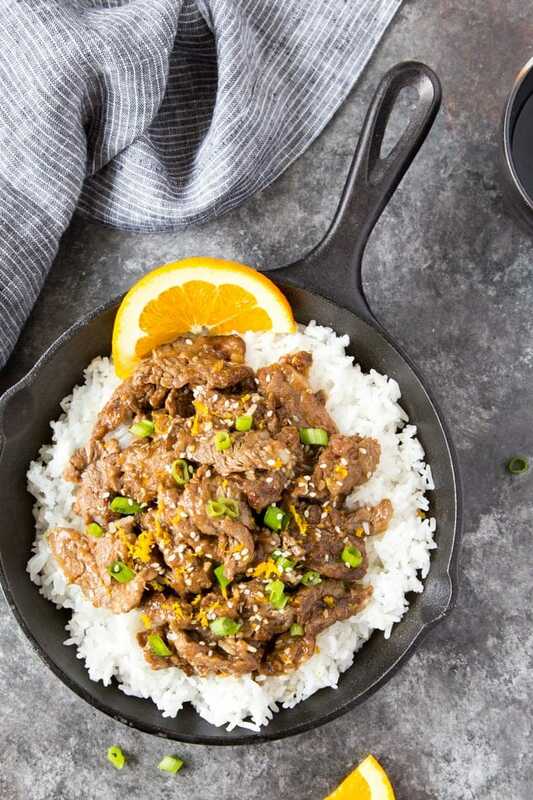 You won’t believe how easy it is to make this popular Asian take-out dish at home. No fancy ingredients needed. Quick and easy! Have dinner on the table in about 20 minutes. Zest an orange, setting zest aside. Cut orange in half and squeeze juice into a cup (you’ll need ¼ cup orange juice total). Add sesame oil to a large skillet over medium-high heat. Cook beef for approx. 2 minutes untouched. Flip beef over (with tongs) and allow to cook an additional 2 minutes. Reduce heat to medium-low, add back beef if you removed any to cook in batches, and add sauce. Allow to cook approx. 5 minutes, until sauce reduces and becomes a sticky glaze. Garnish with orange zest, sliced green onions and toasted sesame seeds. To optimize tenderness you’ll want to cut the flank steak “across the grain”. This means cutting across the fibers of the meat (not the same directions as the fibers). For most flank steaks the fibers run the length of the meat which means you are going to be cutting across the width of the meat. Here’s a video from Cooks Illustrated if you want more info on cutting flank steak against the grain. Orange Juice/Zest- For optimum orange flavor I’m using the zest and juice of one orange in this recipe, because I think it elevates the flavor of the beef to include both the juice and orange zest. If you prefer, you could substitute ¼ cup of your favorite orange juice for the fresh squeezed and omit the zest. Leave room when cooking beef in the skillet– make sure to leave space around each piece of beef when cooking so the beef becomes crispy and not “steamed”. It may be necessary to work in batches if your skillet is not large enough to cook all of the beef strips at one time. Serving suggestions- Serve over rice, cauliflower rice, or in lettuce cups. Pairs well with steamed broccoli or sesame bok choy. 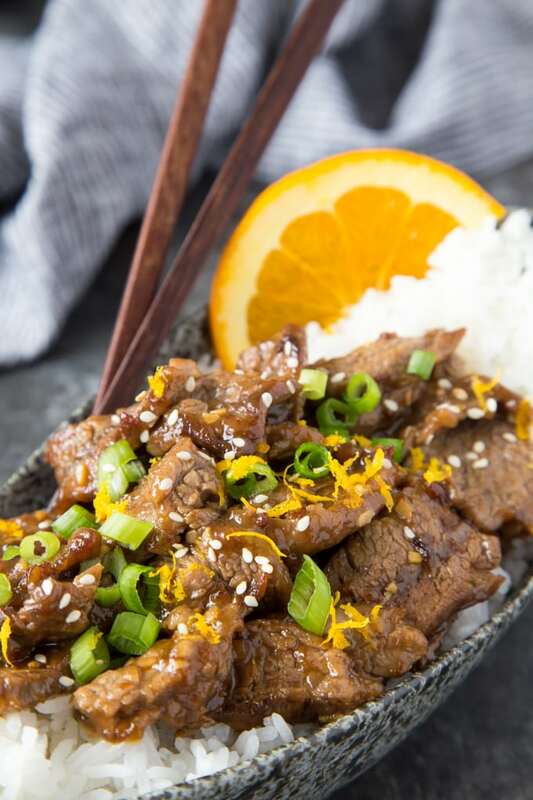 Skillet Sesame Orange Beef – Tender strips of beef are smothered in a flavorful sesame orange sauce with garlic, ginger and a touch of brown sugar. Quick and easy! Have dinner on the table in about 20 minutes. In a large bowl (or ziplock bag) add beef slices and cornstarch and mix to thoroughly coat beef. Set aside. Wash orange thoroughly. Use a microplane or grater to zest about 2 tsp orange zest. (Alternatively use a vegetable peeler to cut a large strip of orange peel and use a pairing knife to cut strip into very thin slices). Set zest aside. Cut orange in half and squeeze juice into a cup (you’ll need ¼ cup orange juice total). In a medium bowl mix ¼ cup orange juice, soy sauce, rice vinegar, brown sugar, ginger, garlic and red pepper flakes. Whisk to combine. Add sesame oil to a large skillet over medium-high heat. Once oil is hot, add beef strips making sure to leave space around each strip (so beef browns and doesn’t “steam”). Allow beef to cook for approx. 2 minutes untouched. Flip beef over (with tongs) and allow to cook an additional 2 minutes. It may be necessary to work in batches if skillet is not large enough to cook all of the beef strips at one time. Reduce heat to medium-low, add back beef if you removed any to cook in batches, and add sauce. Allow to cook approx. 5 minutes, until sauce reduces and becomes a sticky glaze. Garnish with orange zest, sliced green onions and toasted sesame seeds. 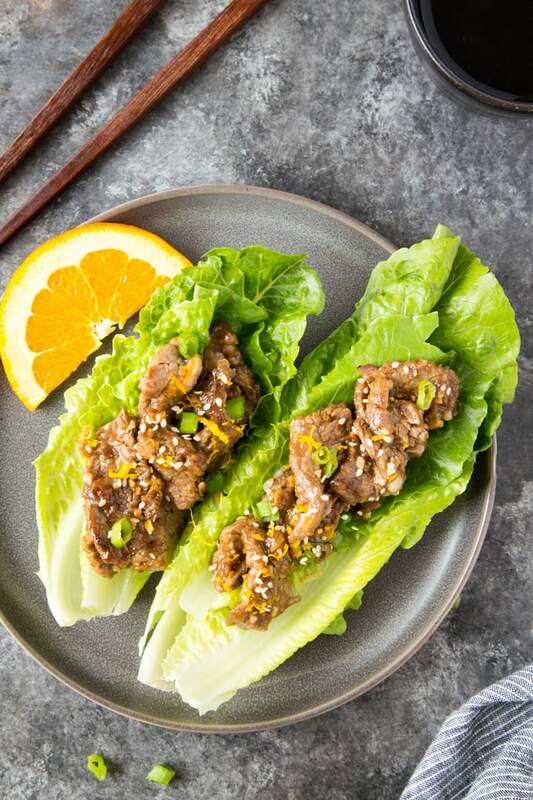 Serve over rice, cauliflower rice, or in lettuce cups.